We get a lot of custom wine label orders for weddings, birthdays, anniversaries and various other momentous occasions. It's a great way to create a personalized gift for someone without spending a whole lot of money. While making your own custom wine labels is fun and easy with our StickerMaker, getting the old labels off your wine bottles can be a pain. Here is a quick guide on how to remove those old labels so your custom labels will fit smoothly and cleanly on the bottles. 1) Fill the sink, bucket, or tub with lukewarm water. Add a couple teaspoons of dish soap while the water is filling. Then add the baking soda and vinegar. This will cause some fizzing and bubbling so we recommend leaving the sink, bucket, or tub half empty so the fizzing doesn't spill over. 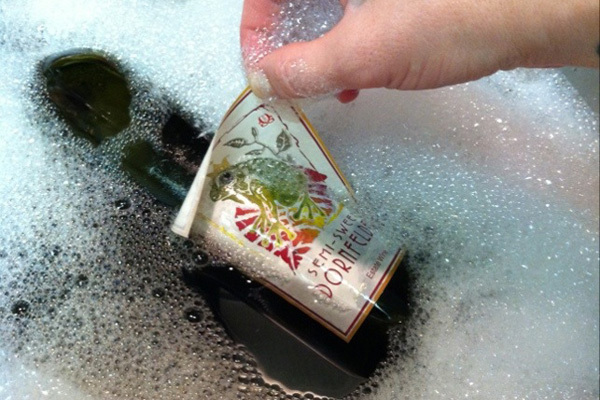 2) Double check that your wine bottles are properly sealed. Quick way to do this is to just hold them upside down for a few seconds. You should be able to see if they aren't sealed properly. If there are no leaks, add the bottles to the water and let them soak for 20-30 minutes. The labels should peel right off the bottles. Let the bottles air dry or towel dry and they are ready for your custom labels. Some wine labels use a thicker adhesive than others. This may result in some residue left behind. You can usually use a rough sponge and dish soap to remove the remainder of the glue. If the labels are not peeling off easily, you can also try increasing the temperature of the water or letting them soak for longer.